For our Christmas party in December we were back at the Blackbird Public House. This year, we teamed up with Rob Van Westen to enjoy not only his current portfolio of wines, but a vertical of his wonderful Bordeaux Blend “V”. The Blackbird put out a great variety of nibbles, just to keep us going. Thanks to Shelley yet again for organizing this party for us, and to Lisa for organizing the pouring crew. It may have been December, but we weren’t finished yet! On December 29th, 31 of our convivial crew headed out to the snowy Okanagan for our third New Year’s bus tour! This was four days, three nights of food, wine, and fun, all in the snowy (and COLD – it got down to -17 at one point) Okanagan. We had absolutely stunning weather, with blue skies and sunshine the whole time. Highlights included our opening reception, where about a dozen people sabered their first-ever bottles of bubbly, a unique Cab Franc vertical hosted by Sandra Oldfield of Tinhorn Creek, a pizza & pasta lunch at Hester Creek's Terrafina, a winemaker’s dinner with Chris Tolley of Moon Curser, an elegant New Year’s Eve dinner dance at Miradoro, and our signature event, the Polar Bear Swim on New Year’s Day. Due to the chilly temperatures, the lake had frozen over, so our intrepid crew broke through two inches of ice and had a Polar Bear Wade. Naturally, we warmed up in the hot tub afterwards! In November, for the second year, we had a dinner in November as well as May. This time, we enjoyed the lovely pairings of Le Vieux Pin’s wines with five delicious courses at the newly-renamed Brix & Mortar. We were joined by Rasoul Salehi, Managing Partner, and Severine Pinte, Viticulturist and Winemaker. With both the wines and the restaurant being so special, it was a truly memorable evening. In October, we celebrated the earliest grape harvest that any of us can remember with a fun walk-around event at De Dutch. 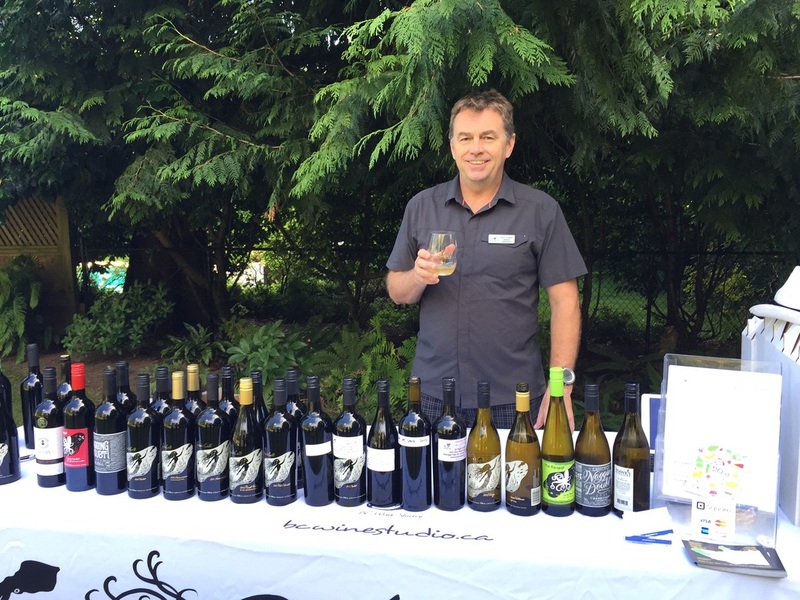 We sipped 12 yummy samples of BC’s finest wines, and we enjoyed the cheeses from Les Amis du Fromage so much in July that we ordered them again. Wine? Check. Cheese? Check. Fun? Check. Everyone enjoys these casual festival-style events so much that we will definitely do more of them in 2016. Watch for the upcoming events on our website! 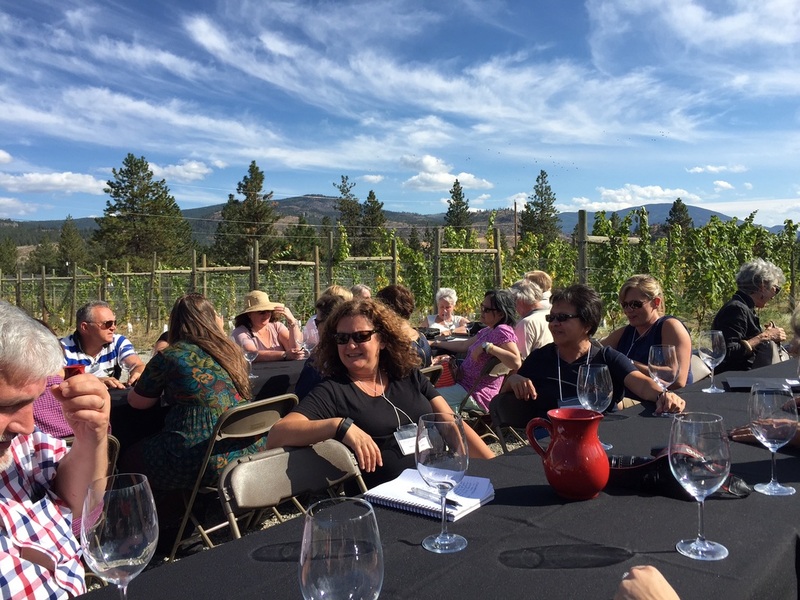 September is the month of one of our most popular annual BCWAS events – the Okanagan bus tour! We were amazed to discover just how popular it really is – we sold all 48 seats in just three days! This year, our 10th, we visited the wineries of Naramata and OK Falls. Saturday, we toured Naramata and enjoyed a lunch at Hillside Winery. 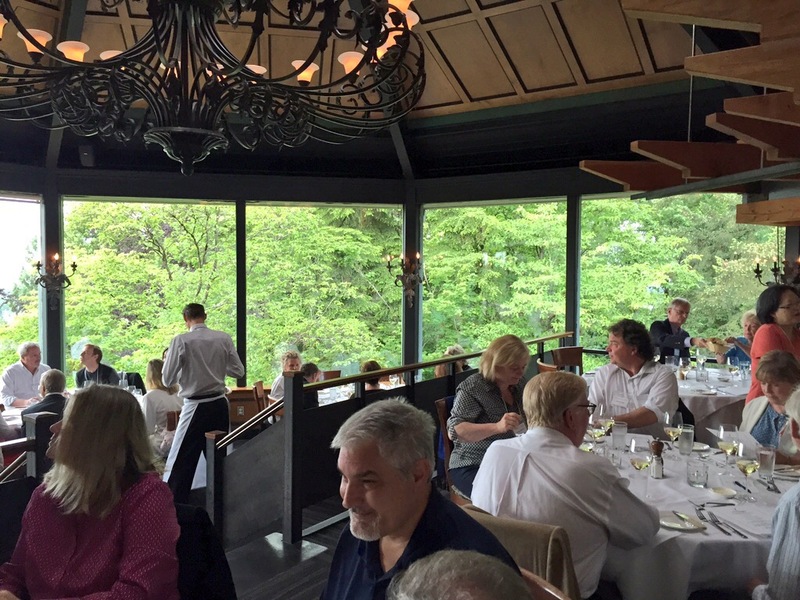 Saturday’s dinner was on the lakeside patio of Summerland’s Local Lounge, where we got to enjoy the delicious wines of Stag’s Hollow Winery paired with each course. Sunday, we visited the OK Falls wineries, with lunch at Painted Rock Estate Winery provided by the always-wonderful Joy Road Catering. While we were there, owner John Skinner told us that another visitor was expected that afternoon – Stephen Harper, our then Prime Minister. It’s the first time that we have ever kept a Prime Minister waiting! In July, we hosted a Call Out To Summer walk-around tasting at De Dutch, featuring an interesting selection of wines from our Society’s cellar and some delicious cheese platters from Les Amis du Fromage. Summer definitely answered our call! It was an absolutely beautiful summer evening, topped off with a stunning sunset. Many attendees of this sold-out event spent some time on the patio taking pictures of the sky with one hand while they held a wine glass in the other. We’re a talented bunch! 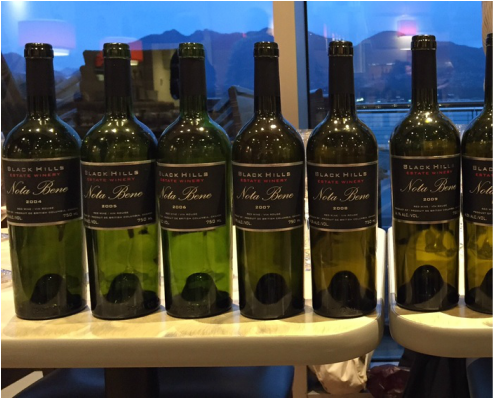 In June, we enjoyed a second amazing vertical tasting, this time of Black Hill’s famous Nota Bene. Glenn Fawcett came out from Oliver to lead us through this fascinating tasting – and was generous enough to bring us two rare older vintages, the 2004 and the 2005. It was so interesting to see how the different weather patterns each year have affected the grapes, and how this shows in each year’s wine. A secret ballot revealed that 2006 was the crowd favourite, followed by 2008 and 2009. ​June 11th was our AGM. This was the second year we have had our AGM at the Vancouver Film School in Gastown. Again this year, the Society purchased a huge order of Chinese food to go along with the BC wines that everyone brought. It was lots of fun and not too much work. :) As we do every second year, elections were held for the three official Directors of the Society. Brian Glaum was elected President, Shelley Hayashi was elected Treasurer, and Vanessa Jacobsen was elected Secretary. Thanks to our new Secretary Vanessa for organizing the venue and Executive Member-at-Large Lisa for getting the food! May saw the first of our two dinners. We’ve visited Meyer Family Vineyards on our September bus tour, but this was the first time we’ve had them come and see us in Vancouver. Seasons in the Park did a lovely dinner for us, and we enjoyed listening to Jak Meyer tell us about the wines. Thanks to Shelley for putting this one together for us. April saw our biggest event ever – our huge Tenth Anniversary Gala, held in the lovely Diamond Ballroom atop the Vancouver Masonic Centre. 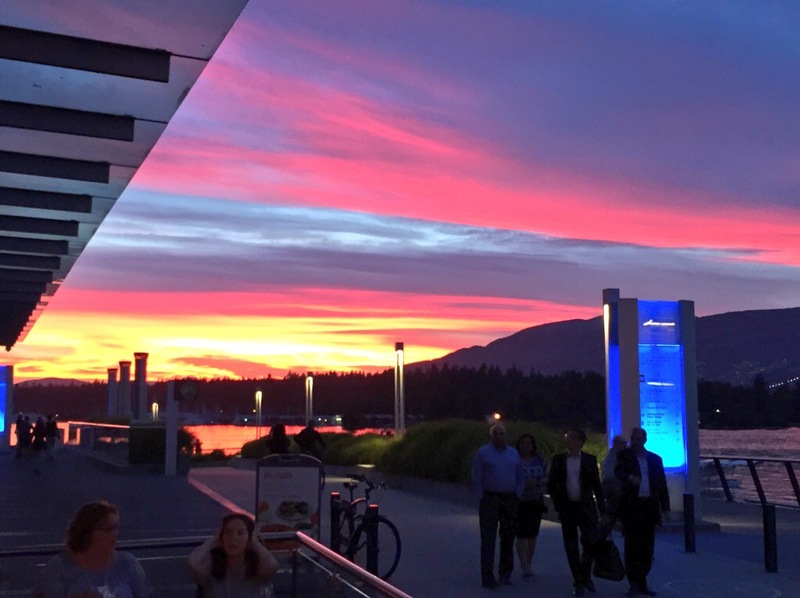 We were lucky enough to have a gorgeous sunny day followed by a beautiful sunset, but lots of attention was paid to the incredible line-up of wineries who came out to celebrate with us. We were both honoured and humbled by the amazing turn-out from our Okanagan friends. We had 47 wineries in attendance, almost all of them with owners and/or winemakers personally manning their tasting booths. 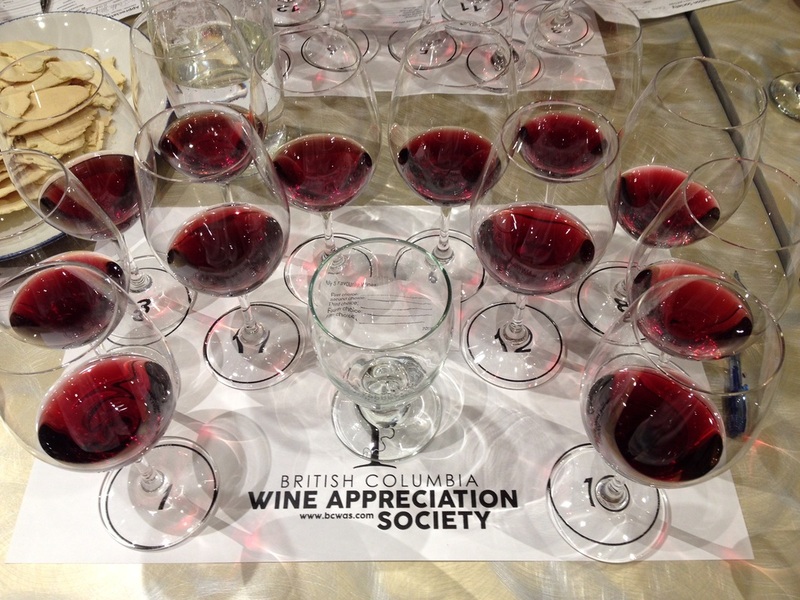 In fact, we had twice as many BC wineries as February’s big Wine Festival! In March, we held our third annual BC vs. the World Double-Blind Challenge, featuring Pinot Noir. (Previous years featured Syrah and Cabernet Franc.) This tasting was moderated by Brad Cooper, who is a Pinot-phile and a double winemaker. He heads up Serendipity Winery’s wine-making team, and also owns his own label, Black Cloud. Black Cloud makes only Pinot Noir, so we thought Brad was a natural fit! Watch for the next version, which, for the first time, will feature a white wine. You’ll get to taste how BC Rieslings fare against wines from around the world. February, we hosted Gavin & Shana Miller of Upper Bench Winery and Creamery. It’s confirmed – cheese and wine do make a lovely couple! Attendees enjoyed tasting Gavin’s excellent wines and we devoured about four pounds of Shana’s delicious cheese. 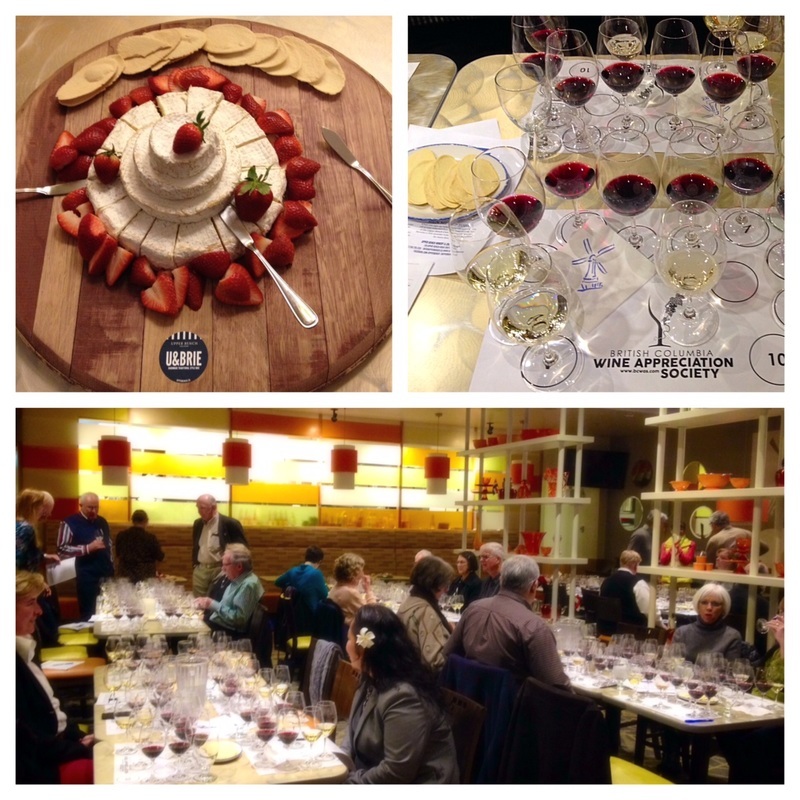 This tasting was also the first official event in our new venue, De Dutch Pannekoek House. 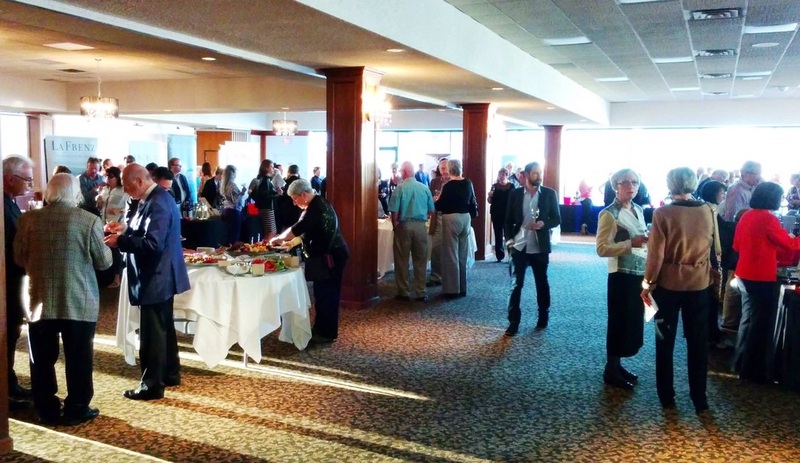 We love having our events there, and we really appreciate Treasurer Shelley Hayashi’s efforts at finding it for us. 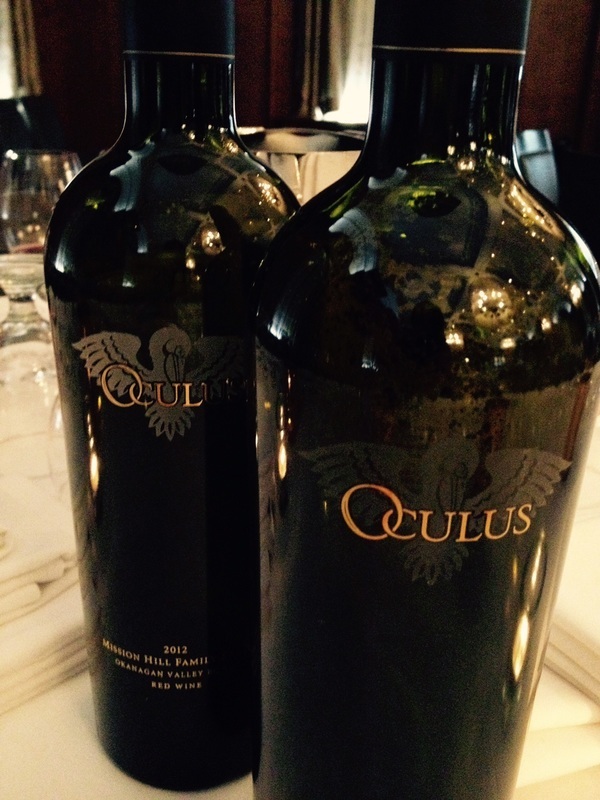 We started in January with a tasting we’d been planning for a long time – an amazing 10-year vertical of Mission Hill’s iconic Oculus. This tasting was led by Ingo Grady, Mission Hill’s Director of Wine Education, in the beautiful and also-iconic Vancouver Club. In addition to enjoying the wines, we also took the opportunity to acknowledge Francis and Tim, the founders of BCWAS. Each received an engraved silver ice bucket – and the thanks of all the happy attendees. A great way to start our year!